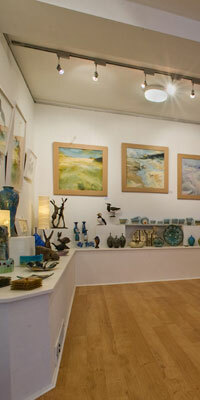 We are pleased to be showing the artwork of Jill Colquhoun from Yealand Conyers in our Spring Exhibition. Her depictions of Buttercup meadows have to be seen to be fully appreciated. The first thing that strikes you is the sumptuous glowing yellow so reminiscent of the fields in the Dales in June. Then looking harder rich depths and layers become apparent of grasses and clover. Marvel at her novel method of combining wax resist batik techniques with acrylic paint. We also have on display a couple of her delicate atmospheric watercolours depicting the view across Morecambe bay. Terrys paintings depict the Northern landscape. His favourite subjects are the fells in this region, Ingleborough being a favourite. He studied drawing and painting at Sunderland college of art, then ran a successful design business in Lancaster. The processes of design have influenced his paintings often selecting subjects with a distinct composition and structure. Linda Lovatt works from her studio in Jedburgh creating pictures and assemblages in a unique and quirky style. Influenced by folk art and French automata, she uses embossed copper sheet which she treats to achieve a deep turquoise and creates her hares, birds, mice and other animals. They are placed on old bobbins, keys, bottles or cup handles and embellished with buttons and beads and charms. Linda was thrilled to appear on Kirstie's Handmade Christmas last December, winning the competition to make a festive wreath. 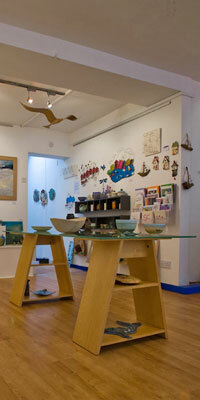 Amanda is a renowned jewellery maker from Hebden Bridge. Her pieces are timeless classics and suit all ages, made from silver and freshwater pearls. We have a good selection of her Lily collection featuring white or peacock pearls including pendants of various sizes, rings and bangles.